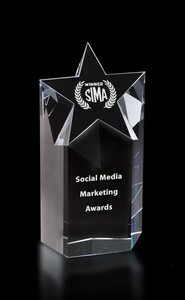 Large Optical Crystal Superstar Award. Star designs can be etched in multiple locations. Engraving of your logo, custom design or text is included in setup fee, No Second Location Charge and No Personalization Charge.